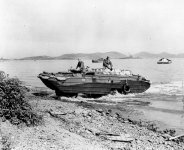 The DUKW (popularly pronounced “duck”) is a six-wheel-drive amphibious truck that was designed by General Motors Corporation during World War II for transporting goods and troops over land and water and for use approaching and crossing beaches in amphibious attacks. The designation of DUKW is not a military acronym, the name comes from the model naming terminology used by GMC; the D indicates a vehicle designed in 1942, the U meant “utility (amphibious)”, the K indicated all-wheel drive and the W indicated two powered rear axles. Although technically a misnomer, DUKWs are often referred to as duck boats. Another popular nickname was old magoo or simply magoo. Though the origin of this term is unknown, it probably refers to the odd shape of the vehicle. Developed by the National Defense Research Committee and the Office of Scientific Research and Development, it was initially rejected by the armed services. When a United States Coast Guard patrol craft ran aground on a sandbar near Provincetown, Massachusetts, an experimental DUKW happened to be in the area for a demonstration. Winds up to 60 knots, rain, and heavy surf prevented conventional craft from rescuing the seven stranded Coast Guardsmen, but the DUKW had no trouble, and the military opposition melted. The DUKW would later prove its seaworthiness by crossing the English Channel. The DUKW was the first vehicle to allow the driver to vary the tire pressure from inside the cab. The tires could be fully inflated for hard surfaces such as roads and less inflated for softer surfaces, especially beach sand. This added to the DUKW’s great versatility as an amphibious vehicle. This feature is now standard on many military vehicles. DUKWs are still in use, as well as purpose-built amphibious tour buses, primarily as tourist transport in harbor and river cities, including but not limited to: Seattle; Philadelphia; Cincinnati; Pittsburgh; Chattanooga; Nashville; Boston; Branson, Missouri; Grapevine, Texas; Saugatuck, Michigan; Liverpool; London; Dublin, Ireland; Rotorua, New Zealand; Belgian coast (Blankenberge, Koksijde) ; The Netherlands; Singapore; Washington, D.C.; Stone Mountain Park, Atlanta, Georgia; and Wisconsin Dells, Wisconsin. The first “duck tour” company was started in 1946 by Mel Flath in Milwaukee, WI. He moved his tour to Wisconsin Dells shortly thereafter. His company has changed ownership since, but is still in operation under the name Original Wisconsin Ducks. His family continues to operate a duck company called the Dells Army Ducks in the Wisconsin Dells Area. One well-established tour operator in the United States is Ride the Ducks. However, the vehicles used are not Army Surplus DUKWs, as used by many other companies, but are rather designed and built from the ground up by Ride The Ducks. Do you mind if I quote you post The DUKW Then and Today « BoatSafe Blog on my blog if I link back to this page?